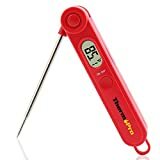 The ThermoPro TP03A is our pick for the best instant read thermometer, which can give you results within 4 to 7 seconds. The accuracy of this device is coupled by its ease of use and foldable design. The food grade stainless steel probe tip measures 3.8 inches and is easy to stick into food. Our step-up pick is the GDEALER Instant Read and it can be used for grilling and other cooking procedures. You get a choice of either black or red and it has unit conversions right on the unit. You can use it in a variety of food types and it has a large LCD screen display. The budget pick is the Habor Meat Thermometer and it can also be used for meat, such as barbecue, smokers, grilling and the like. It can detect as fast as 4 to 6 seconds and it has a long probe top for reaching into the food. 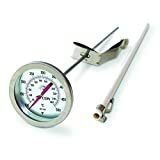 An instant read thermometer is mainly used for cooking meat. They are regarded as one of the most indispensible tools around the kitchen, especially for those who maintain a restaurant or simply want to cook to perfection without overdoing a piece of meat for your recipe. 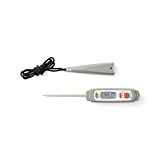 They are easy to use tools that work well in measuring the temperature of your food, specifically meat. They are different from medical ones in terms of usage and functions. Unlike the medical one, this one focuses more on reading the temperature of food so it might not be that suitable with human temperature. Both of them have different maximum scales because food can have more temperature rises than that of human temperature. You obviously cannot survive oven temperatures but your roast turkey can. They have a metal stick that is the one that is used for detecting food temperature. This metal stick can be either inserted onto the meat, such as chicken or turkey, or can be placed on the side with the help of your food strings, if present. The stick is like the main part of a temperature device that instantly read the current temperature of your food. The temperature of meat while being cooked is important to know for certain recipes. This temperature can let you know if your chicken or turkey is undercooked or overcooked, so that you will be able to make some adjustments later on. Any food that is either undercooked or overcooked can bring about some health problems so it is important to know the done-ness of the food item. They can also come in various colors. While colors are not a major factor in deciding the ideal kitchen tool, they can also make them much more visible when it comes down to looking for them in the kitchen or food prep area. Cooking with a highly visible tool makes it easier to find later on, so you do not cram with measuring the temperature of your food. LCD screen: the screen should be easily visible and should not have faults in the design. Having a big and clear screen with easy to navigate menus is important for any kitchen tool, especially if it will be used for a restaurant and for rush cooking needs. It is important that all lf the information that you need in the tool can be found on the screen. Waterproof: being waterproof is important for any kind of temperature measuring device that is supposed to be used on food and kitchen needs because it might get wet at some point due to the oils and the like. It is important that all of the parts of this kind of mechanism for reading temperatures are well protected from short circuiting and thus ruining the whole unit – there should be sufficient ways to protect its internal parts. Home or professional use: you should know if you are using this kind of temperature measuring equipment for home or for professional use. 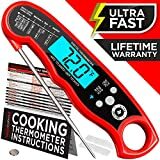 For home use, it should be easy enough to be used by anyone and for professional use, it should come with extra features that will make your work easier and quicker when measuring the temperature of the meat or food that you want to use it with. NSF approved: consider one that is approved by the NSF or National Science Foundation, to know that its accurate, safe and professionally calibrated to be as accurate as possible for both home and commercial use. It pays to invest in something that is NSF approved for it to be truly accurate because measuring temperatures is a work of science and therefore should have a scientific basis. Cooking application: some are used for baking while others can be used for other cooking methods. You should consider what kind of cooking you often do, whether it is baking a cake, a pie or usually roasting turkeys for thanksgiving or roasting chicken for your family, friends or guests. It pays to know which kind of cooking application the temperature device works best for. Size: consider the size of the temperature device when choosing one. This is because some of them can be more suitable for smaller roasts while some are more ideal for turkeys and larger pieces of meat that are fresh from the oven. It pays to know the right size of temperature device for your food measurement needs so that it will be much more accurate in reading the temperature of your food item. Accuracy: you should have something that is as accurate as possible so that it will not fall short with being undercooked or overcooked in the long run. 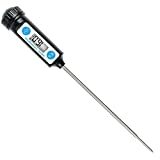 Having a totally accurate temperature device is highly important in food service so as not to make the customers feel bad about having a raw or overcooked food item, especially for roasting meat. Color of the housing: while not really an important factor, in some kitchens, this is important so that it will be easily visible so you can locate it right away when you need to measure the temperature of your food right that instant. In some situations, the color of the housing can also match your other kitchenware and tools so they can all complement each other when you are cooking for your guests due to the aesthetic value. Conversion between Fahrenheit and Celsius: this is highly important as not all countries use the same unit of measurement with temperatures. 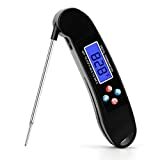 There are countries who use Fahrenheit but some countries use Celsius, so it is important to pick the right one for your needs depending on the unit that you frequently use for measuring temperatures, especially for your food. The conversion mechanism should also be simple enough so that it will not be too tough to switch between the units. The ThermoPro TP03A is our top pick because of its very fast reading time of only 4 to 7 seconds. It can be used from -50 to 300 degrees C or -58 to 572 degrees F for its temperature range. It can be used for either indoor or outdoor cooking and has a quality stainless steel probe tip. It is also backed by a 5-year warranty. The only non-deal breaking con of this ThermoPro TP03A is that it might not be as durable as the higher priced ones, but that is okay considering the price point and features. The GDEALER Instant Read is our step-up pick because of its ease of use and range from -4 to 392 degrees F. It is also wide in its digital display and can bring results from 4 to 20 seconds. It can be used for barbecue parties as well as for grilling. The Habor Meat Thermometer is our budget pick, which is also fast enough at giving results from 4 to 6 seconds. It is made with food grade stainless steel for the probe tip and can be used for turkeys and other poultry as well as for barbecue parties. It has an auto shut off feature to save battery life as well. Great for turkey as well as for manual detection of temperatures, the CDN IRL500 is for you. It has a range of 100 to 500 degrees F and has a stainless steel clip so it can also work as a candy type. The glass lens is made of quality and food grade material. You can use it for deep fat frying and it has a 5-year limited warranty. The CoZroom is great for those who want a digital designed unit that has a battery that can last up to 4,000 hours of operation. It can operate from -58 degrees F to 572 degrees F and it can be used for your barbecue parties. It has an easy to read screen and has a clear LCD for simple temperature reading. For a waterproof unit, the Taylor Compact is a good choice because of its easy to read LCD screen and its antimicrobial housing. You can use it up to 450 degrees F and it is quite portable in its design. The black nylon lanyard makes it easy to handle even when far away. The Alpha Grillers is a choice for a barbecue party for finding out the correct meat temperature. It can work within 4 to 7 seconds in detecting the temperature of your meat and it can be easily calibrated. It also comes with a handy meat temperature guide for your reference. For outdoor BBQ parties and the like, the KOOZON is a good choice because it can be as fast as 2 to 6 seconds in temperature reading. It can convert your unit to Fahrenheit or Celsius depending on what you prefer and it is quite portable and foldable for outdoor use. If you want to reach deep down into food and sauces with a long probe, the Anpro DT-10 is an ideal choice because of its 4.9-inch probe tip that is handy for measuring hard to reach foods or while in the pot. It has a protective silicone cap that is of food grade. The CDN DTQ450X works great for poultry such as chicken and turkey and is also NSF certified. It has a temperature range of -40 to 450 degrees F and is battery powered using a regular LR44 battery. Its stainless steel probe is of food grade and measures 5 inches in total. While others were very promising, they did not live to the expectations because they lacked in features that make them easy to operate and were also not very accurate compared to the ones that we picked in this review set. Q: What are the benefits of using a food thermometer? 1. It is important in knowing the right and safe temperature of your food when it is cooked. 2. It is important to make your food cooked just right, avoiding overcooking and undercooking. 3. Any kind of food that is overcooked and undercooked can be a haven for food illnesses and the like. 4. Any kind of overcooking or undercooking can make food presentation go haywire as well. 5. Simply guessing may not always be applicable with food temperatures, unless you are an expert. Q: How do I calibrate the food temperature measuring tool? a) Prepare a pot and fill with tap or distilled water up to 3 inches. b) Bring it to a boil. c) Insert the end of the device. It should read at least 212 degrees F or its equivalent in Celsius. a) Prepare a tall glass and fill it with whole ice cubes. b) Add the cold water into the glass. c) Wait for 1 minute. d) Insert the device in the middle of the glass. e) Read the temperature using the device. It should be 0 degrees C or 32 degrees F.
Q: What are the differences between the instant read and the leave in type? They are mostly used for those times that the food is already cooked when you want to check the temperature of your cooked food. They are meant to be left in the oven or cooking device so you could know the temperature of food as it cooks. This kind of device usually looks like a regular medical temperature measuring device but with a longer metal stick. This kind of device has a longer stick than the instant read and usually has a wire that connect the stick to the main console of the device. They can be super portable due to the small pocket sized design. Some of them can also be pocket sized so they are easy to take with. They can be straightforward to use. They can also be very easy to use. Anything that is cooked on the stove is much more appropriate for instant read types. Anything that is cooked in the oven is much more appropriate for leave in types of this device. Q: How advantageous is an instant read unit compared to leave-in or probe types? 1. The width of the stick or probe tip is very thin compared to that of a leave in type. This makes your food more presentable and less likely to leave a large hole onto your food. 2. It will be much more accurate than a leave in type because of its nature as a instant read type. 3. The range of temperatures that you can measure with this kind of device is much more compared to that of probe types or leave in types. 4. It saves you a lot of time in the long run when compared to having to use a leave in type of device due to the instant response to reading the temperature. 5. You might only need to insert at least 1/8 of an inch through the food with this kind of instant read device compared to that of a probe type in which you need to put it against the food as deep as 1 inch, which can leave some mark onto your food. Q: What are the benefits and types of meat thermometers? a) It keeps your food fresh and away from illnesses because of being undercooked. b) It prevents overcooking any type of food so that it will become much more tender and juicy. c) You do not have to guess the doneness of the food if you measure its temperature accurately. d) It pays to maintain the right temperature because it will prevent the likelihood of bacteria in some places where food can cool quickly. e) You can also use it to reheat your meat products without sacrificing its important nutrients but killing the bad bacteria that might be lurking in the cold spots. It is important that when reheating, all the cold spots will disappear for an evenly heated food item. a) The digital ones are the ones that are meant for easy reading as well as for different meat cuts that specifically require a certain temperature. They can be specifically used by butchers and meat shops in order to determine the right temperature to store the meat or to cook it. b) The microwave or oven types are the ones that are meant for place in the oven or microwave along with the food. It may feel like cheating but it is important in getting to know the doneness of the food while it is cooking or roasting. They can be ideal for soup making, pots, pies, casseroles, turkey, chicken and other oven goodies. c) The timer type is the one that is used for when you like to multitask. They are basically ones with a timer option so that you will know when to check on the meat product or any kind of food you're cooking as to when they are perfectly done with the right temperature or doneness. d) The instant read type is ideal for meat and they can be used right after cooking your meat or even before cooking your meat. They can be used on the fly because of their instant response, making them super convenient for meat temperature checking. e) The fork type is a special type that looks like a fork tine but can read the temperature of the meat. 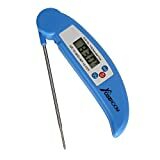 If you are having a feast and want to detect the temperature without ruining the presentation then you can use this kind of fork type device to measure the temperature of the meat to see if it is done nicely. Q: Why is it important to measure the temperature of meat? 1) It helps you to know if it is overcooked. 2) It helps you to know if it is under cooked. 3) You will know the safe temperature of the meat. 4) The meat recipe will look more presentable when it is cooked in the right temperature. Q: What are the ideal temperatures to aim for with meat? Q: How do I use the unit for meat? 1) Prepare your temperature measuring device. 2) Aim for the center of the meat. If you can’t find a center then go for the coolest part for an accurate reading for the meat. 3) Slowly pierce through the meat and note of the numbers. 4) The numbers might slowly rise or fall depending on where the end of the probe tip is at. Q: What are the pros and cons of the instant read type? a. You can use it in other food types other than meat, such as soups, casseroles, pies and roasts. b. It gives you instant and quick results to save you time and effort. c. It is widely available in most stores and shopping malls. d. You can use it for the initial and the final temperature of food. e. They can be calibrated easily depending on the model that you have. a. They are not meant to go inside the oven so you have to wait until the food is cooked to measure the temperature of the food. b. They cannot work well if your food is too thin in texture. Q: How are the meat types different from all-purpose, candy and appliance type units? You will most likely use them for meat products, such as turkey, pork, beef and chicken. They can be used for a variety of purposes, such as for deep frying, baking and others. They can be clipped onto a pot so they can be used while boiling as well as for deep frying. They can be used for the oven, freezer and fridge for measuring food temperatures. They can be either leave in or instant read types. They can come in either analog or digital types. They have a clip on design and do not have probe tips. They are usually analog and stand up on their own. They can be used in the oven or while food is on the table. They can be used anywhere depending on the user manual. They are used on pots and pans. They are used on kitchen appliances. Q: What is cross-contamination and why should I be concerned? a) Food might pass bad bacteria from one to the other. b) It might ruin the taste of your other food (e.g. your cake or pie or any other sweets might become salty due to your roast turkey). c) Any food that is cross contaminated can have bad effects for your health. Q: Is it possible to use this kind of device on measuring human fever and vice versa? a) The highest temperature of a human being is around 41 degrees C or 106 degrees F, by which food can go beyond that scale in the oven. Therefore, it might not be that accurate. b) The probe tip is of a different size and length when it comes down to the human counterpart so they are not really meant for piercing into your cooked food item. c) The temperature of your body may have a slightly different course than that of food, so it is best to just use the probe tip of a real temperature device that is specifically meant for food rather than for measuring your fever or flu. Q: What temperature concerns should I remember with leftover food? 1) Make sure you don’t leave your food out of the fridge for 1-2 hours, especially when the temperature is very hot, at around 32 degrees C or 90 degrees F. Leaving your food out in the open can make it more prone to bad bacteria and that might make your food spoiled later on. 2) Make it a habit to put your leftovers in much more shallower containers. This allows the food cooling process to work quickly before you place it on the fridge. 3) To keep your leftover food from spoiling, place it in the fridge within 2 hours of being a leftover from the table, to about 4 degrees C or 40 degrees F to avoid inhibiting bad bacteria. 4) If you will not serve the food right away, consider keeping the temperature of food above 60 degrees C or 140 degrees F so that bad bacteria will not form. 5) You can also use other cooking equipment such as warming trays, slow cookers and chafing dishes to make your food stay warm for a longer period of time. A warming drawer can also be great for oven foods or leave your food in the oven for about 150 to 200 degrees F or 65 to 93 degrees C.
6) Ensure that your fridge stays below 40 degrees F or 4 degrees C to maintain coldness that will be enough to keep bad bacteria from spreading onto your food and spoiling it. 7) Use a container that has a cover and is microwaveable when you want to reheat any leftover in the microwave so that it will be evenly heated. 8) The best temperature to reheat foods with is at least 74 degrees F or 165 degrees F on its internal temperature. Q: How are analogs different from digital ones? It can be hard to read them so it can be difficult to get an exact reading. They show the exact temperature so you can get a more exact reading. Analog units are always easier to clean. You have to find one that is waterproof in order to make it easier to clean. They can be much more affordable, since they are analog in design. They can be much more expensive, although they are still available in most stores. Analog ones can be found in candy types as well as appliance types. Digital ones can be found in meat types as well as some other kitchen types. They can be placed anywhere depending on what they are intended to measure. Some can even read temperatures while in the oven or while food is currently being cooked. Q: How do I prevent food from spoiling and getting microorganisms? 1) Know how to properly store your type of food. Basically, different food types are handled carefully and with different methods of storage. You should check the label if you need to store it in the fridge or freezer right away, and many other ways of preserving it. 2) Prioritize perishable goods such as veggies, fruits, meat and the like. Anything that is damp and has some water or natural juices in it is most likely to perish or spoil much quicker than those in cans, packs and pouches. 3) If you have to leave food out of the fridge, make sure it is only less than 2 hours, especially if the temperature is around 90 degrees F or 32 degrees C. There is a bigger chance of food spoiling if the temperature is too hot and the humidity is out of control. 4) Ensure proper spacing in your fridge and don’t put too much. In this case, you should plan your groceries first before you actually place them in your fridge, so as not to overcrowd it. If you absolutely must buy a lot of foods for a big celebration, you can just ask a neighbor to borrow some space for refrigerating your other perishable goods. 5) If you have a ready to eat food, make sure you eat it right away because they have a chance of getting listeria, a type of bad bacteria that can make you sick if it grows. If you have to refrigerate it for the next day, make sure you consume it as soon as possible. 6) Keep your fridge temperature below 4 degrees C or 40 degrees F so that food will not have a chance of forming bad bacteria and spreading onto your food, making it spoiled. This is an important concern so that your food will not cause food borne illnesses. 7) Know the signs of mold in food. If it smells bad then it might be molded and spoiled. In some cases, there can be slight discoloration or some green in the food that will indicate that the food is somehow spoiled with bad bacteria. 8) Unclean water sources can also be the source of some foodborne illnesses, so it pays to have distilled water in case you are not that used to the water in your area, or if the water in your area tends to be not clean enough. 9) Always wash your hands when you are preparing food. This is a common sense tip, but having hands that have been used for other things can harbor some harsh illnesses that can come from microorganism and bad bacteria that might make your food not only taste worse but might also make you sick in the long run. 10) Remember to wash your produce before you cook them. Whether you bought your fruits and veggies from an outdoor market or whether you bought them from an air conditioned supermarket, it makes no difference as both of them can still be susceptible to dirt and debris so it is important to wash your produce before you prepare and cook them. 11) Know the safe temperatures of your food. We mentioned a chart above as to what are the safe temperatures in handling your meat products. You can also find the safe temperatures of other food types such as fruits and veggies, in order not to make them overcooked or undercooked. 12) Raw foods and ready to eat foods should be separated. This is because the perishable nature of raw foods can also get affected by the ready to eat foods and some of their preservatives. Therefore, it is wise to just separate them when you are preparing them. Q: What are the downsides to eating overcooked food? 1) Your food loses a lot of nutrients. 2) It might also ruin the presentation of your food. 3) People might not find them tasty anymore. 4) Toxic substances can get into food, especially if it is over-grilled. 5) Too much smoke can put carcinogens into food. Q: What are the downsides to eating undercooked food? 1) There is a chance you might get salmonella poisoning with slightly raw foods such as chicken. Salmonella poisoning is characterized by vomiting, nausea, diarrhea, headache, cramps and fever. 2) Campylobacteriosis might also occur, which is a kind of illness that is characterized by diarrhea and fever, especially when you have undercooked chicken. 3) Being poisoned of the Staphylococcus aureus can also happen if you don’t cook your meat right away, and this can cause some symptoms like vomiting and diarrhea. 4) Clostridium perfringens can potentially happen if your meat was not kept warm enough when it is being heated. You can get diarrhea, nausea and cramps with this type of typical food poisoning. Q: How should I handle rare meat in terms of temperature? Q: If I burned my food, does it pose a risk of cancer? A: Yes, there can be some evidence that burnt food can potentially be carcinogenic or can cause cancer in some way if they are prepared in the wrong way. 1) Make sure you follow the instructions or recipes on cooking any food item. 2) Putting potatoes in the fridge before cooking them can actually increase acrylamide levels. 3) Always watch over your food when you are frying, baking or roasting, and make sure you stop at when they turn golden brown or yellow. 4) You can always eat a more balanced diet to counteract the effects and risks of cancer from burnt food. Q: How do I minimize the likelihood of cancer risks in burnt food? a) Consider high quality meat and fish products that will be less likely having bad bacterial infections. Don’t go for overly frozen foods such as the pre-packaged ones. Consider making your own ground beef with a home meat grinder if you want to make hamburgers. Leaner cuts of meat can also be much more healthier than the fatty ones. 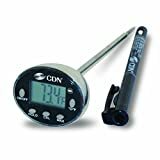 b) As much as possible, prevent overcooking and undercooking by investing in a food thermometer to measure the correct and safe temperature of your food. This can help eliminate guesswork. c) Marinades can help reduce the formation of HCA and can minimize cancer risk. Consider marinades with acid, such as yogurt, wine, lemon, lime, vinegar or similar juices. d) Grilling your food properly instead of frying them can be much healthier, especially with vegetables such as asparagus, zucchini, peppers, cauliflowers and the like. You can also grill some foods such as pineapples and peaches. e) Using herbs and spices such as oregano, rosemary, basil, sage and thyme can help reduce the risk of cancerous effects to your body, especially if you use it together with your marinade. 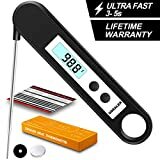 Overall, the ThermoPro TP03A is our pick for the best instant read thermometer due to the long probe tip, food grade design and ability to fold and use whenever you go.